We are finally getting a run of sunny and warm days. Cornelia says this sort of day is exactly what one hopes for when thinking of an Irish summer’s day. I’m feeling like a local. I know where everything is and I run into people I know on the street. At the café this morning Hazel, Cornelia’s right-hand gal, passed by with Robert Pinsky. He’s just arrived from Boston and they were looking for an Irish SIM card for him but said they’d come back for coffee. I read the blurb about him in the festival catalogue and had just started in on his Wikipedia page when they returned. I learned he was US Poet Laureate from 1997 to 2000. He’s a poet, obviously, and an academic at Boston University. Jewish, from New Jersey. That’s about all I knew as we started chatting. Cornelia had to go and Hazel, while she stayed on, was hard at work at other tasks – so Robert and I had a nice chat about American politics, guns, violence, Australia, John Howard & guns, etc. He hasn’t yet visited Australia, but would like to – this seems a worthy project to help with. The rest of the morning I ran around for Cornelia. I delivered lunch to an organist at the Cathedral. And I picnicked outside St John’s Priory – pressing my ear to the stained glass to hear the Bach Cello Concerto being played within. At 4pm I went to the Rothe House Garden for Robert’s “Secret Garden” performance, which was quite good. Afterwards Cornelia and I took him to the Architects of the Air installation. 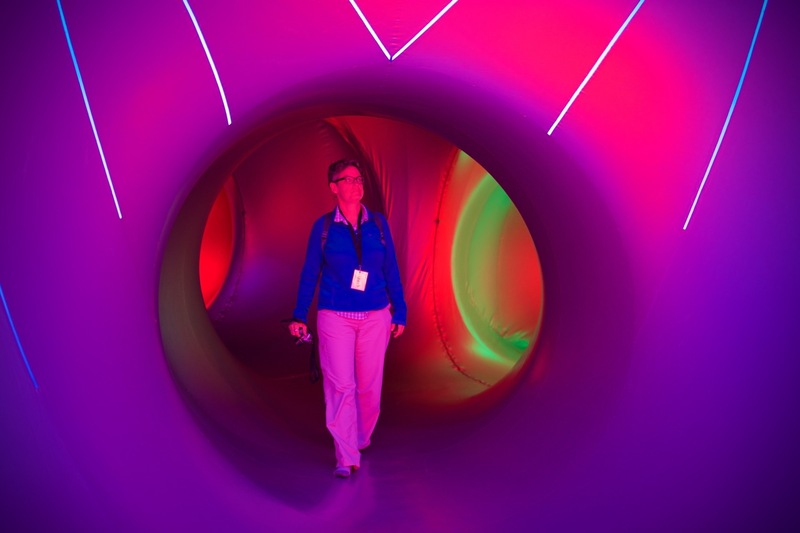 The Luminarium is a pneumatic sculpture (one filled with air) constructed of specially designed plastics where the colours of the material and the design of thinner bits illuminate the inside just by the natural light. Each luminarium is a dazzling maze of winding paths and soaring dorms where Islamic architecture, Archimedian solids and Gothic cathedrals meld into an inspiring monument to the beauty of light and colour. The domes are the large chambers rising up to 10 metres high that provide the focal points. The tunnels connect the domes and determine the journey the visitor will take. The luminaria also feature ‘pods’ – alcoves where people can sit and relax out of the way of the other visitors. Each luminarium is made up of around 20 elements that are zipped together on site to typically occupy an area of 1000 square metres. Easy to erect, laying out the structure and anchoring can take as little as 4 hours then, in just 20 minutes, the luminarium is inflated to its monumental size. W got ice cream and sat in the Butler House Gardens. He was, I think, just trying to keep going to keep jet-lag at bay. A plight I well understand. Cornelia had to go and left me to see Robert back to is hotel but first we lingered. We chatted away about politics and swapped Clinton stories. He told me about his Favorite Poem Project, which he began as Poet Laureate and continues. They hold events where everyday people share their favourite poems and there’s a web site with videos of people sharing their favourite poems. It’s been quite a while since I’d had such a long chat about stuff I know and care about with someone who knows as much or more about the same stuff – if that makes sense. The conversation was very enjoyable and unlike any I’d had recently. He gave me his card … if I get to Boston I’ll drop him a line. Now I’m sitting at Zuni having had a glass of white wine and a serve of chips. I’m waiting on Cornelia to return. My face is sunburnt and I’m very sleepy. Cornelia arrived and we ordered some more wine and, then, Jim! Oh, my goodness how nice it is to see him. 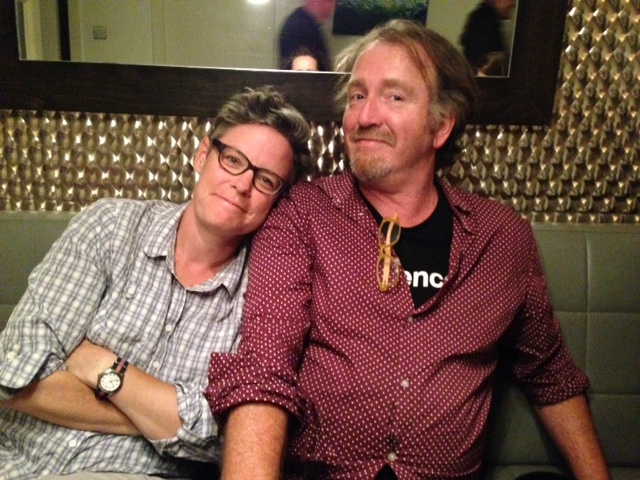 I’ve seen a few old friends along the way and made many new ones but I hadn’t seen anyone from my immediate, loving, fabulous circle of Sydney friends for 78 days (when Jim and Vickianne saw me off at the airport) and now, here, was one of my besties and someone I’ve known for 27 years. I think I got a little teary.